The nut and fifth string pip can be made from a variety of materials. For nylon strung fretless banjos I like ebony. For steel strings I usually use bone or antler. The nut should sit proud of the fingerboard a little bit. The notches in the nut should be evenly spaced and cut to the size of the intended string diameter. I usually rough out the nut, or, two or three of them shortly before I plan to string the banjo up. I wait until that first string-up, the final assembly, to cut the slots into the nut. There are tiny files made to the exact string sizes commercially available, they come in very handy. A fine needle file will often suffice for the job of filing out the string slots as well. It is good to make the initial cuts with a razor saw. For the first and fifth strings the slot made by the razor saw may be enough. As you string it up for the first time fit each slot to the string. Widen the slots just enough to let the string slip through without binding. If you think the slot is really close but the string still seems to be binding, try marking in the slot with a pencil, the graphite will act as a lubricant. 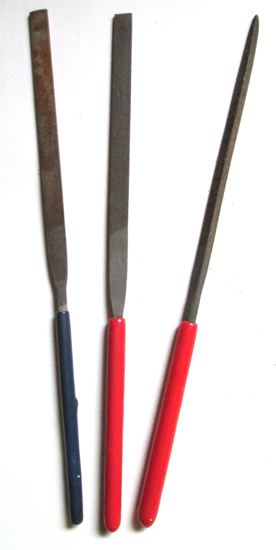 An inexpensive set of hardware store needle files. The pip is like a miniature nut just for the fifth string. It can match the material for the nut, or I sometimes use ebony instead. Using ebony for the pip on a steel string banjo will quiet down the fifth string a little bit, which can be a good thing. The pip is typically round and sits in a little hole made just for it on the nut side of the fifth fret. I have seen some banjos that use a flat head screw that acts as the pip, simply letting the fifth string ride over the fifth fret. Some players also enjoy the use of “railroad spikes” to act as a capo for the fifth string. They are called railroad spikes because that is what they are, miniature railroad spikes from model trains. They are installed just behind whichever fret is to be capoed at, this can make switching between tunings on the fly a little easier. The bridge is fun to make yourself. You can make your own by using some of the scraps left over from band sawing the front profile of the neck, it will already have good hard wood on the top edge. Commercially made bridges are good too. There are a lot of variations on the basic theme of a banjo bridge. The bridge can change the sound of a banjo dramatically. Experiment and have fun!